What makes this meal planning kit so special? This meal planning kit makes sure you track your estimated cost for each meal and every grocery you plan to buy! A vital step if you are looking to cut thousands of dollars each year from your spending! Once you get your FREE toolkit you will be all set for weekly meal planning but ALSO to maximize your savings with the MONTHLY meal planner! So the toolkit includes a weekly meal planner, monthly meal planner, and a budget grocery list. All tools have areas for you to keep track of estimated costs so you can be sure and stick to your budget! We just did our monthly grocery shopping and shared the trip on my Instagram Stories recently. Head over and follow me for up to the minute updates! 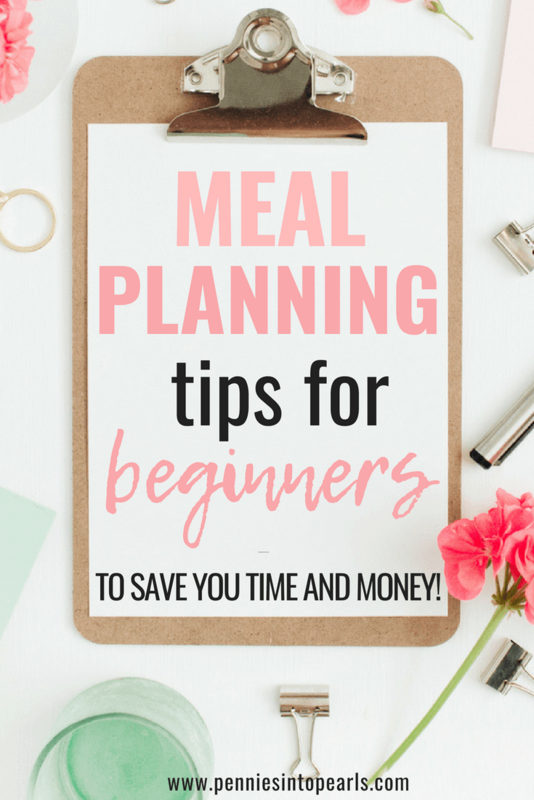 In this article I am not only giving you a free meal planning toolkit, but I am sharing my best tips on how to minimize your time when it comes to planning but still maximizing your savings! Why you NEED to meal plan! I could talk all day about my love for meal planning. Seriously! If you are ever in the San Diego area, let’s go to lunch and I could talk your ear off! Until then, you can read this article to see how meal planning saves our family over $500 a month. Psst! That’s over $6,000 a year! That’s a nice chunk of change! You will fall in love when you find out how much time this system will save you! You can also take a look at my complete monthly meal plans that our family actually eats every month! Along with all my monthly grocery hauls that will show you exactly what our family buys every month and the exact dollar amount that it costs. 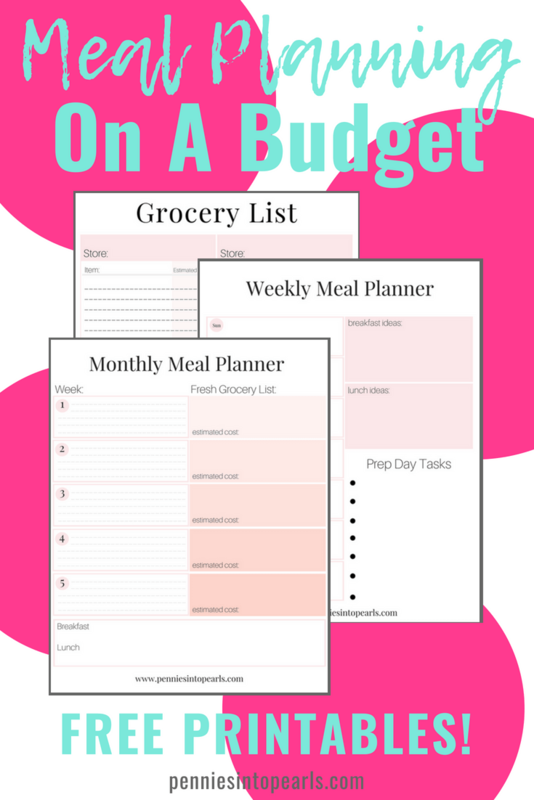 Before we dive into how to use this meal planning on a budget toolkit, you will need to download it for FREE right here. Just fill out this short form real quick and it will be sent right to your email! One of the first things I do after bringing the groceries into the house is go through my favorite rebate app and see what I can get quick cash back on. If you aren’t already signed up with Ibotta, you can use this link or use this code: qybjrj and you will automatically get $10 back after you claim your first rebate! If you are brand new to meal planning, the perfect place to start would be with weekly meal planning! 1.The very first thing you will want to do is pull out your personal calendar and look to see if you have any special events or holidays this week. Any super busy nights where you know you are going to need a crazy easy meal? Crockpot anyone? Write those events right on the corresponding day of your meal planner. 2.Before you even start drooling over recipes, you need to first shop in your pantry, fridge and freezer. By shop I mean, look through all these areas and base your meal planning off what you already have at home! That way you don’t end up buying double of something you have already spent money on, or you don’t let something rot in the depths of your fridge. Which is pretty much like throwing your money straight in the trash! Also, don’t forget to plan your meals off what groceries are on sale at your local stores! Try your best to only use ingredients for you meal planning that are on sale. 3. Next up, start scrolling through Pinterest and searching your favorite cookbooks for meals your family will scarf down! BUT WAIT a second, you are only going to plan for FIVE MEALS each week! This is super important! Only plan five meals for each week! The reason being, you will eat leftovers at least one night a week. If your family doesn’t usually have leftovers, consider beefing up your meal size to leave extras at the end of a meal. Trust me, cooking a larger meal is so much easier and cheaper then cooking an entirely different meal. The second reason is that you could add in a “fun” night to your meal plan, a night where you get to eat out. Don’t go crazy! Use coupons and look for promotions, and use discount apps like Groupon! Maybe it’s a date night out for mom and dad or a family night out, whatever your “fun” night entails make sure that you factor it into your budget! Expert tip on choosing your meals… choose meal ideas that use meat as more of a side attraction. Meat will most likely be the most expensive part of your meal. So the less meat you use, the lower your meal will cost. Some examples of meals that use less meat would be ones like casseroles, salads, soups, or pastas. So once you have your five meals for the week picked out you can start filling out your meal planner. This post contains affiliate links at no additional cost to you. Thank you very much for supporting Pennies Into Pearls by using my links! 4. For each recipe you choose and after you have already looked through your pantry, fridge, and freezer, you can start filling out your grocery list. This is where your budget comes into play! When you use the grocery list provided in the Meal Planning on a Budget Toolkit you will see that first, you separate your grocery list by store. If you are planning your meals around items that are on sale, to save the very most money you will probably end up going to more than one store. Though I don’t recommend going to more than two stores for weekly meal planning. Side note: Make sure you check down below to see how you can get FREE TWO HOUR shipping on your groceries from your local grocery store straight to your front door. Simply by using Amazon Prime Now! On your budget grocery list you will also see a column for you to fill out the estimated cost of each item. Every single item on your grocery list should have the cost you expect to pay written out. Then at the bottom of each store you can total out the estimated cost per store. This is SUPER helpful for your budget because if you end up with a total far above your budget, you will need to rethink your meal ideas to include less expensive ingredients. Another reason this column is super helpful is because once you get to checkout you want to make sure that the total showing up on the register is close to what you have written down. If the numbers are completely off , there could be a few different errors that you want to be aware of. One, some items may have been wrung up more than once. Or two, some items that were on sale might not have wrung up at the correct price. Both of which you should bring to the attention of the cashier to make sure that you aren’t spending more than you need to! At first you might not know exactly what prices to write down for your “estimate cost”. But the more you use this system and the more you pay attention to prices each time you shop, the better you will get and the more accurate your estimates will become. 5. Next, write out which meal you plan to eat on which day. Don’t forget to also fill in which day you plan to eat leftovers and which day you plan to eat out. Every day on your meal plan should have something written on it. 6. Write out your “prep-list.” Any opportunity you have to prep more than one meal at a time, you are going to save a lot of time! That is why on the weekly meal planner I have included a section for you to list out items that you can prep for several meals all at once. Examples of this would be doing things like, pre-cooking or pre-grilling meats, or chopping veggies. Any task that needs to be done for more than one meal should be written on this list. 7. Then lastly, there is an area for you to list out ideas for breakfast and lunch. Make sure to include any needed grocery items on your master grocery list. Our family tries to keep these two meals as simple as possible. I will do weekly meal prep of making and freezing things like muffins or breakfast burritos. Then for lunch a lot of times we will either eat leftovers or simple things like sandwiches or wraps. Having this section all written out will make it easy for the entire family to see what options they have available that week. Making mom’s life a little less stressful without the constant nagging of “what’s for lunch”? I seriously hate lunch sometimes! If you want to completely stay away from the stores, you might be able to use Amazon Prime Now! This app is AMAZING! You can download it for free on your mobile device. You can order your groceries simply from your phone! Imagine, shopping kid free, crowd free! Shopping in your PJ’s! Amazong Prime Now is available for all Amazon Prime members. It is FREE two hour shipping of your groceries! Just make sure to meet the reasonable minimum purchase amount, which varies depending on which local grocery store you shop through! You are able to order pretty much anything that the selected grocery store has to offer in store. If you aren’t already an Amazon Prime member you can sign up here. The cost of membership is easily compensated by the hundreds of dollars you save through meal planning! But also, being a member has multiple perks when it comes to online shopping, for anything really! Other perks come when reading books online and also streaming video online! SO many services all wrapped up in one! I couldn’t be happier with my Amazon Prime Membership! I use it ALL the time! If you are ready to take your meal planning up a notch and really maximize your savings, then monthly meal planning is waiting for you! A lot of the tips are the same as weekly meal planning, though the process for monthly meal planning is on a slightly larger level. One of the main reasons I LOVE monthly meal planning (other then it saves us THOUSANDS of dollars) is because it saves me so much time! One big grocery haul at the beginning of the month and then a quick stop at the store once a week for fresh groceries. That’s it! 1. To get started, you will actually use the same tips I shared in steps 1 through 4 in How to Use Your Weekly Meal Planner above. All the same strategies in choosing which meals to use in your planning are only going multiply your savings when applied here to monthly meal planning! Don’t forget that you are only going to be planning out five meals for each week of your month! You probably have noticed that the layout of the Monthly Meal Planner on a Budget is different then most monthly meal planners. I don’t have it set out in a calendar layout. I am going to tell you exactly why that is! I used to have a set meal for each day of the week. But the problem was that when that day came I might not “feel” like eating what I had scheduled. That would result in a mess of Xs and arrows all over the meal planner. By simply listing the meals of the week, already having all the groceries you need, you are able to decide the night before or the morning of what sounds good. Our family has been much happier eaters this way! 2. Because you are going to be planning so far out in advance and you still want to provide your family with a healthy meal using fresh fruits and veggies, your grocery list is going to be a little different. You will use the Master Grocery List for all non-perishable items. This is the list you will take with you at the begging of your month to do your large “monthly grocery haul”. For each week on your Monthly Meal Planner you will see a corresponding section where you can list out all fresh produce needed for that weeks meals. Don’t forget to fill out your estimated cost in these sections! This makes it super easy for you at the beginning of each week to take a snap shot on your phone of your fresh grocery list, and then head off to the store for a quick 20-minute shopping trip. Your list is all ready to go every single week with ZERO prep time needed from you that week! And don’t forget! You can use Amazon Prime Now to have your FRESH groceries shipped to your front door for FREE! Make sure you read a few paragraphs above all about what Amazon Prime Now is and why I am obsessed with it! 3. You might need to rearrange your budget a bit. The way our family works our Monthly Meal Planning Budget is we allocate $300 for our monthly groceries, then $25 each week for fresh groceries. So that is a grand total for our family of five of $400 each month for food. We are able to spend such a large chunk of our budget at one time because we live off of last month’s income. Check out this article from one of my favorite personal finance blogs, Jessi Fearon the Budget Mama, all about how you can live on last month’s income! 4. Then we can’t forget about breakfast and lunch! At the bottom of your Monthly Meal Planner you have a section to write out ideas for these meals. As you are making your list, be sure to add non-perishable items to your master grocery list. Don’t forget to download your Meal Planner on a Budget! Whew! There you have it! I know this has been a ton of information but I hope that I have covered everything you need to know so you can use this meal planner to help your family stay on budget and save thousands of dollars each year! If you aren’t quiet convinced on meal planning, make sure you read How to Cut Your Grocery Bill in Half to get more details on how you can drastically cut your grocery bill! This was really helpful!! I’m totally going to my pantry right now to start my meal planning. I will say, though, I got SUPER EXCITED when I saw that I could get my groceries delivered from Amazon since I’m a Prime member. Unfortunately, they are only doing it in large cities and not even a SINGLE city in my state has it yet. Bummer! Awe man! That’s a bummer about your state! I know they are working on it so hopefully they get it to you soon!! Try looking up your local grocery stores to see if they do delivery. Sometimes their delivery fees are super reasonable, like only $5! Plus, sometimes you get free delivery on your first order. Hi Brittany, new to your site but have already implemented your monthly meal planning with all the printables and have to say, I feel so much more relaxed about February and feeding my family of 5, thank you! I put in my information early today for your beginners budgeting starter kit and I still have yet to receive anything. Is there another way to get to it, or maybe there is a slight glitch? I have been anxiously awaiting it’s arrival in my inbox! Is there a link to the recipes for the meals in your monthly plans? They sound wonderful, and I’d love to make the same meals you do but dint have most of the recipes. I’m new to all this meal planning! Thanks! !